Today's character is Dogwood City's first entry of this style: Explorer Joe. 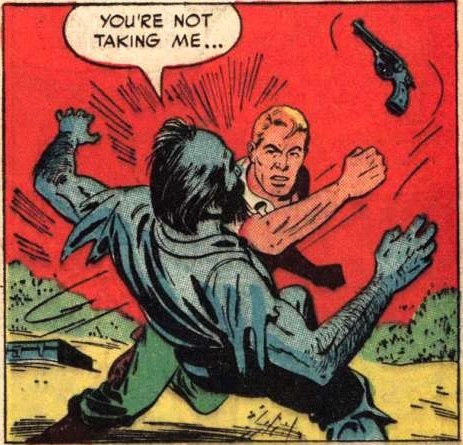 It appears that Explorer Joe only appeared in a couple of comics back in the early 50s. He really didn't predate the DC adventurers by all that long, and in fact is sort of a transitional character in that gray area at the intersection of the Golden and Silver Ages of comics. Joe is a former officer in the Army who travels the world with his sidekick, Gadabout Swanson. One of his motivations seems to be the mysterious disappearance of his father in the Congo 20 years earlier; Joe is convinced he's still alive. At any rate, exploration has become a big enough part of Joe's life that he's now known as Explorer Joe. So, exploration is his thing, you see. These days, a lot of us would probably see Explorer Joe as an Indiana Jones-style character, and he can certainly fill that role when needed (although it doesn't appear that Joe has the academic background of the good Dr. Jones). At the very least, as you can see above, Joe has a solid right hook. I'm going to propose that Explorer Joe has a permanent residence in Dogwood City (as permanent as a globetrotter like him can have one), having stayed there after graduating from the prestigious Dooley University. You can read a bit more about him in his PDSH entry. These really are fun character types. Reading about him makes me want to watch some Johnny Quest. Good call. It's a largely untapped genre for RPGs, I think...Science + Adventure! I love seeing these public domain heroes brought back to life. I agree. 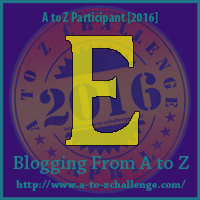 Linneman's posts for this A-Z have inspired me to work on my first pdf release. I'll be talking blogging about it soon. Really? That's awesome; I look forward to reading about it!